Check Out Sneak Peek Of Thirty Seconds To Mars Upcoming Music Video For "Hurricane"
Thirty Seconds To Mars picked up their 4th EMA award last night in Madrid when they were announced the winners of the 2010 Best Rock Band Award. It was a massive night for Thirty Seconds To Mars in Madrid last night. Not only were they nominated in 3 categories, they performed a show-stopping performance of their new song “Hurricane 2.0” featuring Kanye West for the first time on television and for the first time with Kanye West himself. Earlier this year they won the 2010 MTV VMA for Best Rock Video for “Kings & Queens,” the first single/video from their new albumThis Is War. Following their win for Best Rock Video at the 2010 MTV Video Music Awards and Best International Group at the 2010 Kerrang! Awards, it was announced yesterday that Thirty Seconds To Mars have been nominated for 3 MTV EMA’s including Best Video and Best Rock for “Kings & Queens” and Best World Stage Performance. The EMA’s will be handed out on November 7th in Madrid, Spain. Fans can vote for Thirty Seconds To Mars in the Best Rock and Best World Stage Performance categories at www.mtvema.com. The band previously announced that they are releasing a deluxe edition of the album This Is Warwhich features a new version of the single “Hurricane” featuring Kanye West, their live versions of Lady Gaga’s “Bad Romance and Kanye West’s “Stronger” for BBC Radio 1’s Live Lounge and bonus DVD content (full track listing below). Following 2-consecutive #1 singles at alternative radio with “Kings & Queens” and “This Is War,” the album’s third single “Closer to the Edge” is currently climbing the charts and is at #23 this week. The video was added to Vh1 this week, joining previous adds at MTV, MTV2, mtvU, MTV Tr3s and Music Choice. Thirty Seconds To Mars is currently on the 2nd U.S. leg of their massively successful “Into The Wild” world tour with Neon Trees, Violent Soho and New Politics (full Schedule below). The first leg of the tour took them to 89 cities in 27 countries where they played in front of over 1.3 million ecstatic fans. The European leg of the tour was the band’s first arena headline tour and they sold out shows around the globe including gigs at London’s Wembley Arena and Paris’ Bercy Arena. They return to Europe in November where they will play arena dates, including a sold-out show at London’s famed 02 Arena on November 30th. Since the December 9th, 2009 release of This Is War, Thirty Seconds To Mars have been experiencing several career highs. They recently celebrated their third #1 single at alternative radio with “This Is War.” “Kings & Queens” hit #1 in January and the platinum-selling A Beautiful Lie’s “From Yesterday” reached #1 in 2007. A Beautiful Lie’s “The Kill” was voted the #1 alternative song of the decade by AOL Radio listeners. 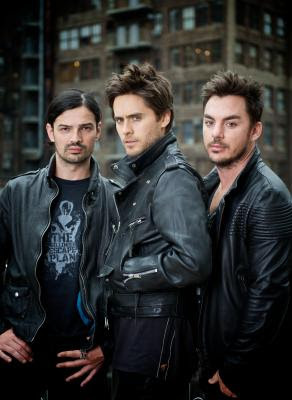 In addition to their MTV 2010 VMA win and EMA nominations, Thirty Seconds To Mars was the most nominated band at the 2010 Kerrang Awards with 4 nominations, winning the award for Best International Band. They have won 3 previous Kerrang Awards, an MTV Video Music Award, three MTV EMA’s, an MTV Latin and Asia Award and a Fuse Award. In further efforts to turn the spotlight onto their fans, Thirty Seconds to Mars is announcing the continuation of its Faces of Mars campaign. Starting today, fans will now have the opportunity to create and own their own Faces of Mars CD by purchasing This Is War at the band’s official webstore at http://30secondstomars.shop.musictoday.com/Product.aspx?cp=366_39496&pc=. As well as this, everyone that lent their image to the first Faces of Mars campaign in support of the band’s wildly successful launch of This Is War will now be able to view their contribution in mosaic form. 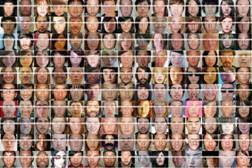 The interactive mosaic can be found at http://thirtysecondstomars.thisisthehive.net/facesofmars/. Started in 2009 to help launch the band’s new album, the innovative Faces of Mars campaign called on friends, fans and other notable persons to submit photos that were used to create over 2000 individual album covers for This Is War. The fan participation contributions did not stop there, events called The Summit were organized in 9 different countries around the world, and then expanded to online, The Digital Summit, where fans were invited to record a variety of sounds, choruses and verses to be used in the album. Their efforts can be heard on various tracks throughout This Is War. Since the December 9th, 2009 release of This Is War, Thirty Seconds to Mars have been experiencing several career highs. They just celebrated their third #1 single at alternative radio with the title-track “This Is War.” “Kings & Queens” hit #1 in January and the platinum-selling A Beuatiful Lie’s “From Yesterday” reached #1 in 2007. This Is War’s third single “Closer To The Edge” will impact radio later this month. It is already climbing the airplay charts throughout Europe and was just A-listed by Radio One in the UK. In December, “The Kill” was voted the #1 alternative song of the decade by AOL Radio listeners. 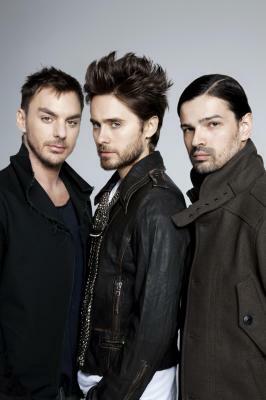 In addition to their MTV 2010 VMA nominations, Thirty Seconds to Mars was the most nominated band at the 2010 Kerrang Awards with 4 nominations, winning the award for Best International Band. They have won 3 previous Kerrang Awards an MTV Video Music Award, three MTV EMA’s, an MTV Latin and Asia Award and a Fuse Award. Last week, Thirty Seconds to Mars announced new dates for the stateside return of their “Into the Wild” tour starting August 30th in Syracuse, NY and running through Oct. 16th at the Deluna Festival in Pensacola, FL. Neon Trees, Violent Soho and New Politics are supporting on select dates. All upcoming tour dates are available athttp://thirtysecondstomars.thisisthehive.net/blog/tour/ . The first leg of the tour took them to 89 cities in 27 countries where they played in front of over 1.3 million ecstatic fans. The European leg of the tour was the band’s first arena headline tour and they sold out shows around the globe including gigs at London’s Wembley Arena and Paris’ Bercy Arena. Get This Is War On Amazon Now! Multi-platinum rock band Thirty Seconds To Mars single “This Is War” reaches #1 on the alternative radio airplay charts this week, after an 8-week run at #2. 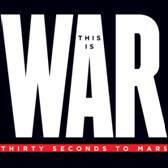 This is the band’s second consecutive #1 single from their 3rd studio album This Is War (EMI’s Virgin Records) which was released in December, 2009. The album’s first single “Kings & Queens” spent three weeks at #1 in January. Thirty Seconds To Mars now has three #1 songs and four top 5 hits at the format. The platinum selling A Beautiful Lie’s “From Yesterday” reached #1 in 2007 and “The Kill” peaked at #3 in 2006 before becoming the first song in alternative radio history to be retired from the Billboard chart after a 52-week run. “The Kill” was named the #1 Alternative song of the last decade by AOL Radio listeners. Their new single “Closer To The Edge” is already climbing the airplay charts across Europe and will impact U.S. radio in August. Last week Thirty Seconds To Mars announced new dates for the stateside return of their “Into The Wild” world tour which kicks off on August 30th in Syracuse, NY at the New York State Fair and runs through Oct. 16th at the Deluna Festival in Pensacola, FL (full schedule below). Neon Trees, Violent Soho and New Politics will support Thirty Seconds To Mars on select dates. Earlier this month, it was announced that Thirty Seconds To Mars leads the nominations for the 2010 Kerrang Awards with 4 nominations, including best album (This Is War), best video (Kings & Queens), best live band and best international band. Fans have until Wednesday, July 21st to vote for the winner and can register to vote at http://awards.kerrang.com. The band is winner of 3 previous Kerrang awards, 1 in 2007 and 2 in 2008. Thirty Seconds to Mars began the “Into the Wild” tour in early 2010 in support This Is War. The first leg of the tour took them to 89 cities in 27 countries where they played in front of over 1.3 million ecstatic fans. The European leg of the tour was the band’s first arena headline tour and they sold out shows around the globe including gigs at London’s Wembley Arena and Paris’ Bercy Arena. The band will play festivals in Australia, New Zealand, Japan, Israel, and throughout Eastern Europe before returning home for the new U.S. dates. Thirty Seconds To Mars will return to Europe in November to play gigs through December and will play at London’s O2 arena for the first time on November 30th. Alternative Press praised This Is War with 4/5 stars and The Los Angeles Times declared that the album is “the most confident sounding thing the band has done.”This Is War debuted at #2 on the alternative album and digital album chart, selling nearly 71,000 albums in the first week of release. The album has 2000 different album covers, as friends, fans, musicians, artists and many other notable persons submitted their own photos to be used on individual covers as part of the band’s innovative Faces of Mars campaign. Not only are fans on the album’s different covers but thousands of fans from around the world can be heard singing on tracks throughout the album. The band invited fans to attend summits in 8 different countries and online, where they recorded a variety of sounds, choruses and versus for the album. Formed by brothers Jared and Shannon Leto, Thirty Seconds To Mars have over 100 million views on YouTube, 50 million plays on MySpace and more than one million fans on iLike/Facebook. The band have won numerous awards and accolades, including an MTV Video Music Award, three MTV EMA’s, an MTV Latin and Asia Award, a Fuse Award, and three Kerrang! Awards. 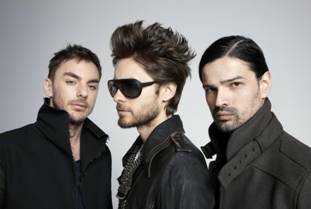 Thirty Seconds To Mars’ sophomore record, A Beautiful Lie hit multi-platinum status after two years of heavy touring and winning fans over, one-by-one, garnering the band a growing and loyal fan base. Get 30 Seconds to Mars on Amazon!